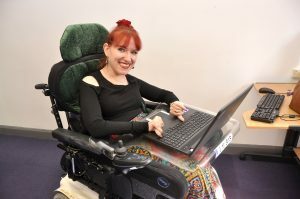 “I had a mainstream education, as my parents believed that it was in my best interest to grow up seeing myself as being on a level playing field with my classmates, regardless of my wheelchair. As a little girl my dad encouraged my love of reading, which fostered in me a vivid imagination and later, an ambition to become a writer of some description. 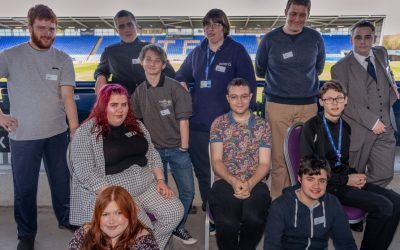 After finishing sixth form, I went to college and achieved an HND (considered to be basically a more practical based degree) in Media, with the idea that I would perhaps get a job in Journalism. After I graduated in 2007, I moved back home to begin the Job Hunt. However, my Nanna, who lived with us, was becoming increasingly frail and in need of constant company, so to enable my parents to continue going out to work, I looked for work that I could do from home… nigh on impossible to find! I started some voluntary work; one job for my church, managing their social media, and another at the Action 4 Independence building in Wolverhampton, working in reception for a few hours each week. After Nanna passed away in November 2014, I started the job hunt once more, but struggled to find anything that was both suitable and local. I contacted my Social Worker, who eventually referred me to Enable. Soon afterwards, the position of Marketing and Digital Communications Assistant became available within Enable to which I was appointed. I started the job in February 2017. I’ve always been confident but now my self-esteem has sky-rocketed! My social circle has widened even further! And I thought that was impossible! I can now contribute to conversations about work, instead of just listening in! “Becky has not always worked. She went away to college in Coventry to study for a diploma in Media Studies when she was eighteen, and when her student days were over, returned home without a plan. For a few years she did various bits of volunteering, but never found the right opening into the world of paid work. Few people can understand the obstacles which someone like Becky needs to tackle to get a job. There are physical obstacles – many places are not accessible to a wheelchair and many jobs cannot be done from a wheelchair. There are though, also obstacles in the mind. Becky, probably like many of you, thought that she would struggle to get an employer to take her on. It is very easy to slip into this way of thinking. Fortunately, Enable saw that Becky had abilities which they could use, and offered her part-time work. Her job has proved to be just what we had hoped for; a friendly, understanding and stimulating set of colleagues who’ve given Becky any help and support necessary, a job that involves a mission – wanting to open up the world of work to other people with disabilities. There is nothing like work to increase your feeling of self-worth. When she meets people, she can talk about what she does at work!